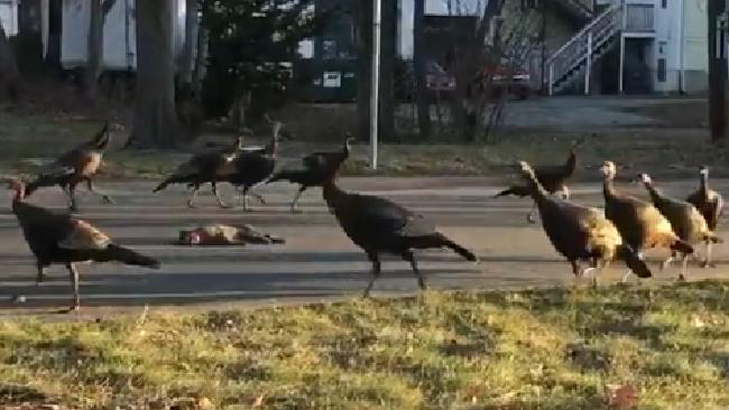 Footage of a flock of turkeys walking in perfect circles around a dead cat has sent the internet into a spin. The video, which was uploaded to social media earlier on Thursday, shows almost 20 of the birds circling the feline’s carcass in the middle of a road. “This is the craziest thing I’ve ever seen,” Twitter user Jonathan, who posted the video from Boston in the US, wrote. “These turkeys trying to give this cat its 10th life.” The post has since been shared and liked more than 76,000 times. “It’s unreal, man,” he said. “My Twitter app barely works with all the RTs. Jonathan said the turkeys circled the dead cat for at least two minutes. “People at work were telling me their friends from other states were watching it and had no idea they knew the person who filmed it … [there were also] people yelling at me and saying [they were] vultures and not turkeys,” he said. Jonathan said National Geographic has since called him and confirmed they were turkeys. Meanwhile, the retweets and responses continue to roll in. “I have read that crows hold funerals for their own but I haven’t heard of birds doing it for other species,” one person wrote. “Bro, they was (sic) waiting for u to give the eulogy,” another said. University of California, Davis, biologist Alan Krakauer, who studies the behavioural ecology of birds said the turkeys “might be performing what’s called a ‘predator inspection’”. “Sometimes, animals lower down in the food chain approach predators — a behaviour that can be seen as risky, but can actually help the prey,” he told The Verge.